Carman Wins 64 Car Shootout At The Million! MONTGOMERY, Ala. – The 23rd Annual Million Dollar Race kicked off on Wednesday with a free test and tune along with a 64 car shootout. Racers competed in the shootout looking to collect one of five free Million Dollar Race entries. In the final round it was Scott Carman taking home the shootout victory over a red-lighting Joe Partin. 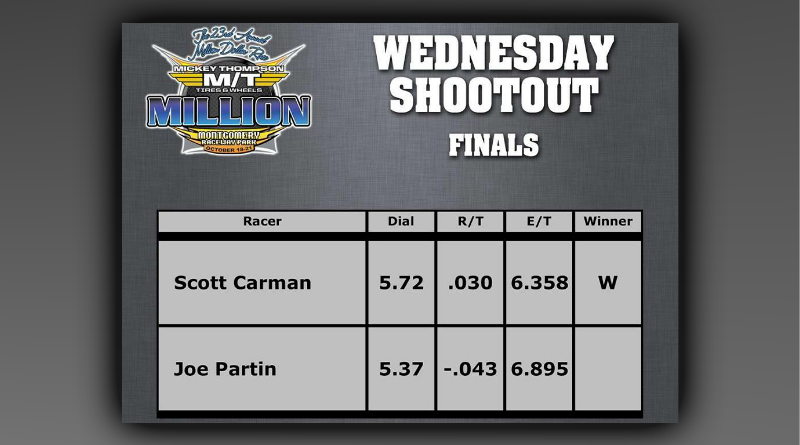 For the win, Carman was awarded a free entry for the entire week while Partin collected a $2k entry into the Million. Other racers collecting a free $2k entry into the Million included Brian Folk, Carl Drake, and Troy Williams Jr.
Hunter Patton, Curt Harvey II, Ken Grant, and Dave Connolly all just missed the free entry to the Million when they fell in round 4, just one round short of the money. Click here to watch the Million live! DragChamp is drag race central for the Million Dollar Race. Visit DragChamp daily for the latest drag race results from the Million!